1. Preheat Panini maker or George Foreman grill. 2. Spread the outside of the sandwich thin, both top and bottom, with ½ teaspoon of butter on each. Split open and spread the inside of the bottom slice with pizza sauce. On top of sauce, place pepperoni slices and top with 1 slice of cheese. Place remaining top piece of sandwich thin, butter side out. 3. 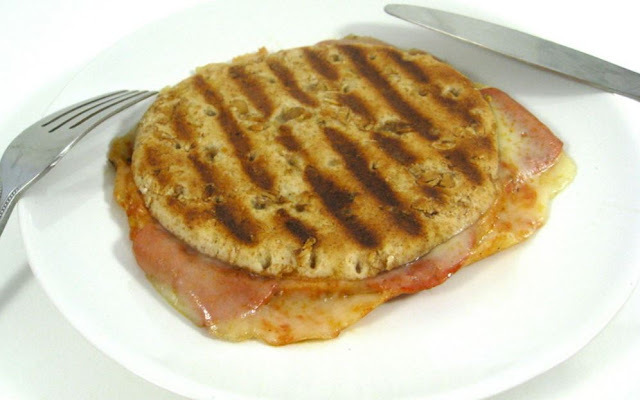 Place in Panini maker or George Foreman grill and cook for 4 to 5 minutes until melted and golden brown. Remove with a spatula as the cheese oozes out a bit while cooking. I love it that way! 4. Serve with a fork and knife.